I own the fastest NG Amiga Compatible - Prove me wrong! > fullscreen (that's why the FPS counter on his page favours OS4 over MorphOS). You mean he ran the OS4 version windowed but the MorphOS version fullscreen? I see no other way Tower57 could give him "65-74" FPS on PowerMac G5 2.5 GHz. Unless, maybe, running it on Radeon 9200 64 MB. But he mentions his Apple machines got stock graphic cards, so it probably was a Radeon 9600. Can someone confirm Tower57 gets only 60 FPS windowed on that config? >> Daytona675x [...] obviously shared with Trevor. > Where can I download it? Link? If there was a (public) download link, there'd have been no need to share it with Trevor in particular. I guess you will have to request it from Daytona675x or Trevor. No. It depends what's going on in the game, the FPS varies wildly. Generally speaking I'd say the low end is 88 FPS and the top end 133 FPS in my limited playing. So the ministry of propaganda comparisons are accurate then, especially considering the game is closed source to begin with. I wonder if TinyGL is even being used on MorphOS. The moment the game is launched my CPU load jumps to 100% and stays there. 100% of cpu load at 2.7Ghz? Generally speaking I'd say the low end is 88 FPS and the top end 133 FPS in my limited playing. And that would be about the same results I get with X850XT. I'm not sure how anyone would consider 60 fps inadequate. It's the baseline average I expect out of a game for smooth animation, BUT drop to 30 or so are still acceptable. The cpu usage is baffling though. 100% on a G5? There IS something wrong here. There is nothing wrong with the game itself, It looks like a fine port. The problem is the bizarre "benchmark" of it to promote OS4 superiority. Indeed. Even in the menu it sits at 100%. That's why I suspect the MorphOS version isn't really using TinyGL and is just relying on brute CPU force. The game happens to have been ported by someone who has also been contracted by A-eon to work on their 3D graphics stack. As was just announced, they will fly him out for Amiwest all the way from Europe even. I do not think it is far fetched to assume that the version for Hyperion Entertainment's OS is the most optimized one compared to the AROS and MorphOS ports. That is perfectly fine and completely understandable. It also does not dimish the value of having Tower57 available for MorphOS as long as the performance is good enough to be playable. Of course, if you want to gauge the credibility of the published benchmark numbers, all you need to remember is that results on AROS were not included... We all know how those would have turned out. The AmigaOS versions use the AmigaOS 4.1 compositing engine not any 3D system. A simple 3D Test/demo under AmigaOS 4.1 will also show cpu usage of 100% . I agree, and I've tried to be careful not to imply it diminishes the port, it doesn't. I just think it is rather disingenuous to publish benchmarks as Trevor has done. As we saw even earlier in this thread, since it is out there in the public domain people ask for it to be included as a valid benchmark for comparison. I also bought the game. First I want to say that the game/fun itself is very good, but the author stated he switched from HW- to SW-rendering!? It's literally unplayable on an Peg2/1Ghz with a Radeon 9200. I've played it for one hour but had to stop then. The frame-rate stays around ~30 if no enemy is on screen, but as soon as there is a combat, the rate drops to 20 or lower. The scrolling is so horrible that it gave me a headache. The original game didn't keep lower specs in mind at all and wasted everything horribly :) Daniel made a huge work to get this converted to our more "modest" machines (modest compared to current PCs). Here is a thread where he replies to questions and talks about the game and reasoning behind the porting. The Radeon 9200 is connected via AGP x4 on Mac minis. The Pegasos II only features AGP x1 speed as far as I remember. Especially when you are using higher resolutions, this might cause a big difference in performance. Thanks for the link, but I know that thread. I didn't read the whole thing, but that response was the reason for me to give it a try. I guess a G4 PowerMac at 1 GHz equipped with Radeon 9200 would run circles around your Pegasos... sadly. > I wonder if TinyGL is even being used on MorphOS. The game is using software rendering on all Amiga-like platforms (i.e all versions done by Daytona675x). 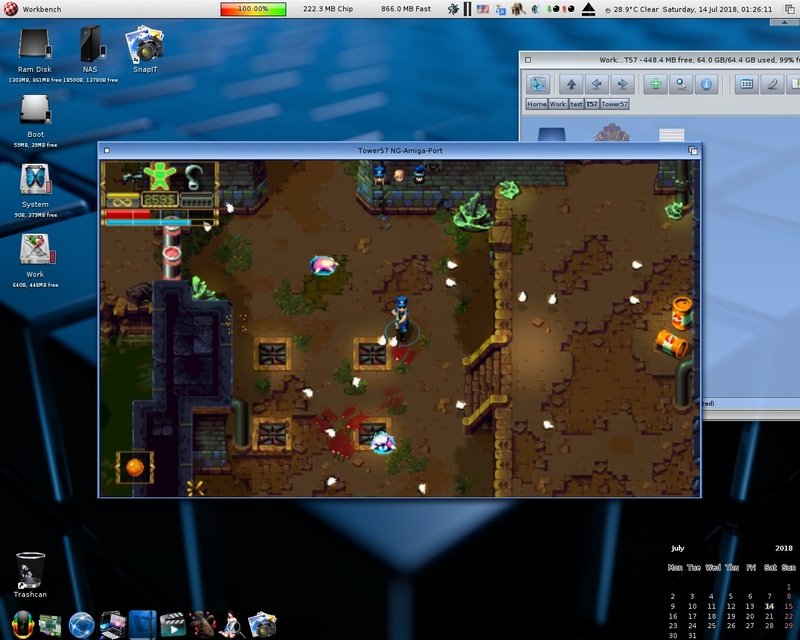 TinyGL on MorphOS (just like compositing on OS4 and Mesa3D on AROS) is only used for scaling the game display to the on-screen resolution. > Either the port is a total technical mess or the original game. The original game uses hardware rendering but needs 1 GiB or so VRAM. That's the reason Daytona675x gave for switching to software rendering. Okay, but then why port such a hungry and obviously bad programmed game in the first place? On a PC you may waste resources like this, but if you plan to release it on different platforms, you have to take some special care, especially if those target-platforms are magnitudes weaker as the original HW. You need a different rendering-path with some kind of texture-streaming, even if that means you have to pause the game at some door and load the next sections, like in Half Life 2. In such a game, the scrolling must be absolutely liquid and unnoticeable. I don't blame Daytona675x, maybe he did the best possible to bring this mess in shape. I blame the concept of advertising and selling a game for "Amiga NG" which then does barely work on the fastest machines available. If it can't be done properly, don't do it. I blame the concept of advertising and selling a game for "Amiga NG" which then does barely work on the fastest machines available. I wouldn't call 130 FPS "barely working". And Pegasos II is currently one of the weakest MorphOS compatible machines available. Because it appears to run just fine on the most widely used systems, i.e. Mac minis and Powerbooks. I blame the concept of advertising and selling a game for "Amiga NG" which then does barely work on the fastest machines available. If it can't be done properly, don't do it. What do you classify as "fastest machines available"? I am afraid your Pegasos II is not in that category. It is below the average both in terms of CPU and GPU (crippled AGP) performance. 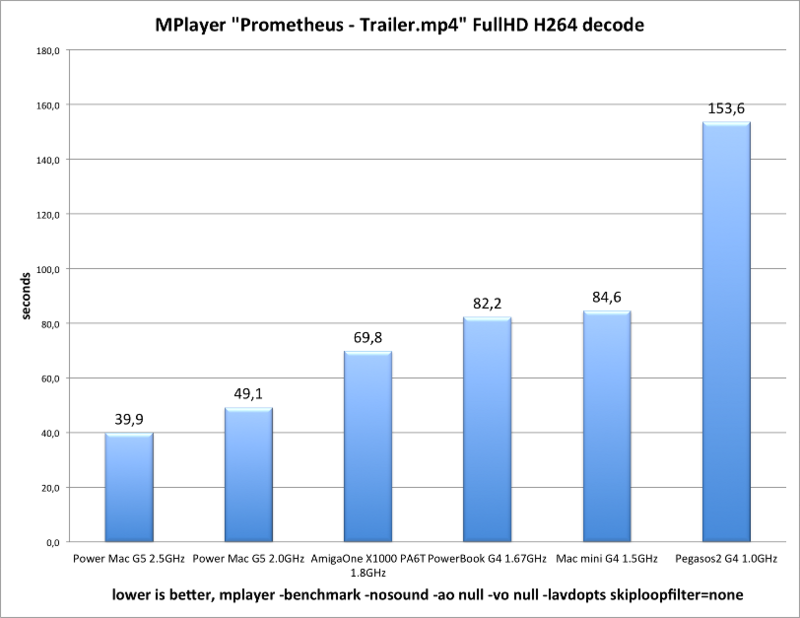 The numbers shared by Mac mini and PowerMac G5 owners indicate that performance is fine on these systems. IIRC the main developer of the game was an ex-Amiga user (or gamer), and he wanted to make a modern game with some Amiga spirit, and he was fascinated by the idea to release it also to NG Amigas. Unfortunately it seems that he/they didn't have realistic impression about hardware capabilities, and even though the game sounded to be portable at first and good promises were made, they changed all kinds of stuff to worse in the middle of the project and Daytona675x had to react to them with the best he could. Daytona675x didn't give up for what's been started and I think it's great for us, because the game is the best (and new!) game we've seen in ages on our platforms anyway. I don't think my Mac mini is among the fastest machines anymore, and still the game runs fine on it. > I wouldn't call 130 FPS "barely working". And Pegasos II is currently one of the weakest MorphOS compatible machines available. > Because it appears to run just fine on the most widely used systems, i.e. Mac minis and Powerbooks. > The numbers shared by Mac mini and PowerMac G5 owners indicate that performance is fine on these systems. Ok, the term "only working" would have been more correct. I didn't look at the benchmarks so far. No, I own the game on both Windows and MorphOS and runs fine (>30-50 fps) on 1680x1050 under a GeForce 9700M GT 512MB VRAM. It just lists 1GB VRam as min. requirement but that isn't representative of the truth. In any case, scrolling is smoother (!) on G4 1,67Ghz MorphOS 9800XT 256MB ram 2xAGP than on a Windows7 Core2Duo@2.3Ghz 4GB Ram, and 9700GT 512MB, which is remarkebly impressive (ok, on MorphOS I run it on 1280x1024 but nevertheless Daytona's work is amazing!). >> The original game uses hardware rendering but needs 1 GiB or so VRAM. >> That's the reason Daytona675x gave for switching to software rendering. > those target-platforms are magnitudes weaker as the original HW.